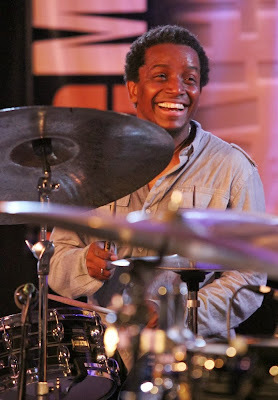 The 56th Annual Monterey Jazz Festival (yes, 56th -- it's the longest continuously-running jazz festival in the world) opened last night on the Monterey County Fairgrounds, and if that wasn't the most perfect opening night ever, it must be somewhere in the top ten. All the stars aligned. The weather was ideal; although the temperature was predicted to drop into the brrr zone, it never did, and the fog that often rolls in to add to the chill stayed away. The crowds were healthy and excited to be there. And the music - the reason most of us drove and some of us flew many miles - could not have been better chosen or performed. 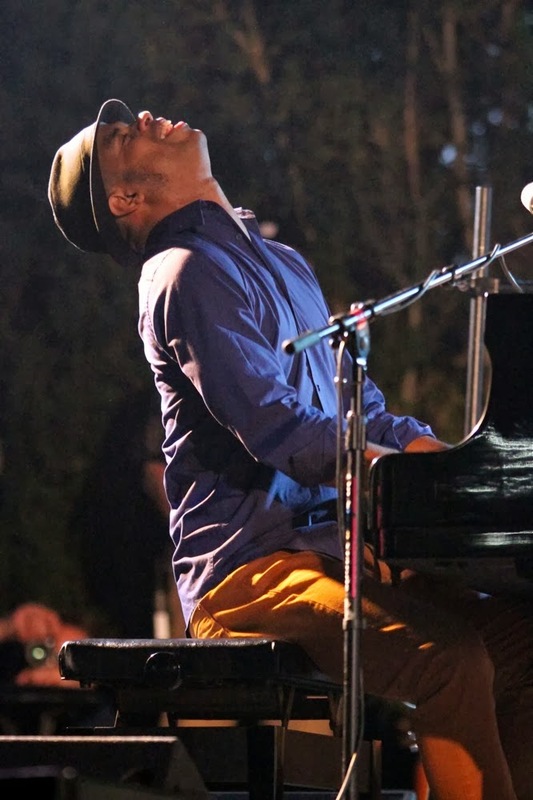 The set that opened the festival - on the Garden Stage at 6:30, soon after the gates opened - featured the Cuban pianist Roberto Fonseca and his band. Raised on music, steeped in music, nurtured by great artists like Ibrahim Ferrer and Omara Portuondo, Fonseca possesses monstrous technique and the soul of a poet. One moment, his fingers were jackhammers; the next, the softest of summer breezes. 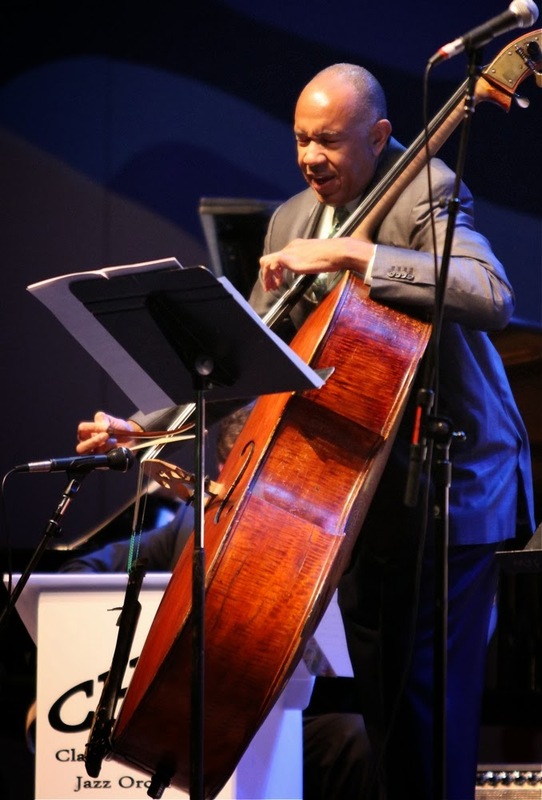 Monterey is about the masters - and this year's festival includes plenty of those, from Wayne Shorter to Joe Lovano, Bobby Hutcherson, Dave Douglas, Dave Holland, Dr. Lonnie Smith and more - but it's also about discoveries. Many people at the Garden Stage had probably never heard of Fonseca. Now they'll never forget him. Tapped to be the first act on the Jimmy Lyons Stage in the open-air Arena, the festival's headliner venue, singer Gregory Porter immediately owned the gigantic stage, the crowd, and probably a good part of the airspace above. This might be unprecedented, but Porter performed here just last year, in the Night Club, where he knocked people over with his big, beautiful voice, storytelling songs (most of which he writes himself), and charisma. That he was back so soon, with an upgrade, says a lot about his rise to stardom. He sang with energy, passion, and command, inviting the audience to join in on the optimistic, affirming "No Love Dying Here" and clap their hands to "Liquid Spirit," both from his just-released Blue Note debut album, also called "Liquid Spirit." Porter is a generous artist; one gets the sense that it's not about him, it's about us - what he wants to lavish on us, how he hopes we will feel. This comes through on his recordings, but it's most evident in live performance, where he gives off gusts of positive energy. Porter has the magic, and he also has a very fine band, with a special nod to saxophonist Yosuke Sato. With Fonseca on the grounds and Porter in the Arena, Monterey set the tone for the weekend: this festival would be sublime, exhilarating, joyous. From the Arena, we returned to the Garden Stage, where the 2013 artist-in-residence, Joe Lovano, led the Berklee Global Jazz Ambassadors - six profoundly talented students, members of the elite Berklee Global Jazz Institute, whose artistic director is Danilo Perez - in an all-Coltrane set. September 23 would have been Coltrane's 86th birthday. Joined by Lovano, the group played "Ascension," "Naima," "Seraphic Light," "Spiritual," "Lonnie's Lament," and more Coltrane tunes. The students were brilliant and fearless, proof that when you're given the opportunity to play with someone of Lovano's caliber, you rise to meet it. 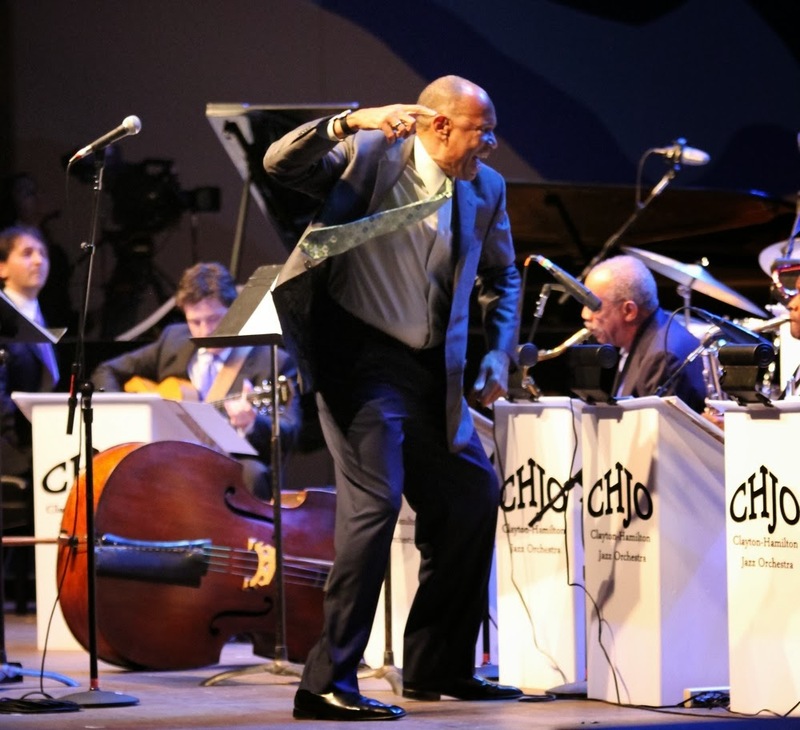 Back at the Arena, the Clayton-Hamilton Jazz Orchestra, one of the best big bands in the world, turned Mingus's "Goodbye Pork Pie Hat" into a buttery ballad and swung hard through Ellington's "Squatty Roo." 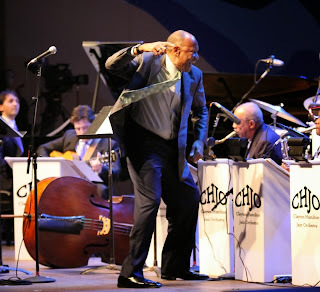 Led by the exuberant, balletic John Clayton, with Jeff Hamilton at the drums, they performed one of the festival's two commissions for 2013: "Suite Sweet Dave: The Brubeck Files." An homage to Dave Brubeck, beloved friend of the festival who died last December, it featured nine seldom-heard Brubeck compositions, arranged by Clayton in all kinds of ways: for the whole band, for soloists, for small ensembles within the band. The shifting melodies, rhythms, and moods sketched a lifetime in jazz and brought Brubeck home to the festival he championed from the start. A highlight: Clayton on arco bass, slow and sad, with light piano comping from Tamir Hendelman. A surprise: hearing Louis Armstrong's voice on Brubeck's "Summer Song" ("Still, and warm, and peaceful"). 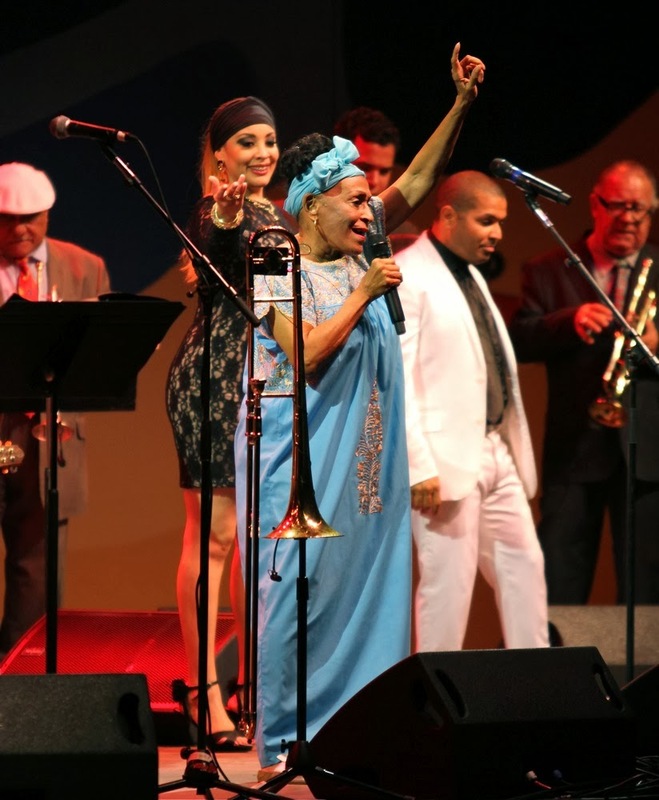 After a taste of the Uri Caine trio in the Coffee House Gallery, we returned to the Arena for the Orquesta Buena Vista Social Club and its star soloist, 82-year-old Omara Portuondo. People danced in the aisles. It was a sepia-toned set, a taste of old Cuba, enchanting under the stars. By now the first night of Monterey 56 was waning, so we dashed through the grounds to the Night Club to hear Joe Lovano and Us Five, his dynamic young band with two drummers, Francisco Mela and Otis Brown III. We heard Us Five plus one: Joe's wife, Judi Silvano, brought her unique vocalise to the stage, singing along with the saxophone or soaring above it, soloing and accompanying, playful and free. 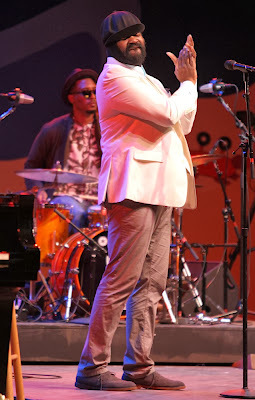 We've heard Lovano play several times before, but we had never heard Silvano sing. Thank you, Monterey. And for that spectacular full-force duet by Mela and Brown.